With an average turnover of close to $1 million and an average risk of return parts fraud of 5% (or $50,000), parts dealers have a financial risk they need protection against. PartMate protects your more valuable stock for approximately $1 a part. Simply spray uniquely numbered microdots on your parts and you’ll have the evidence you need to prove they’re yours – or not! DataDot’s solutions include innovative, overt and covert technologies developed in a joint venture with leading research institute and Australian Government authority, the CSIRO. 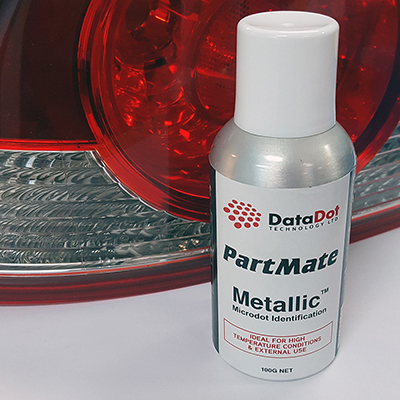 The product used by Parramatta Prestige for their auto parts program, PartMate, combines microdots with encoded serial numbers and a hidden tracer that can be viewed with a black-light. The program was introduced by Parramatta Prestige in early August and almost immediately had their first success. A customer purchased a BMW drivetrain differential that had been marked with the technology. 3 days after making the purchase, the same customer returned to Parramatta Prestige claiming that the component was faulty. However on examination with an inspection torch no identifiers were found, proving that the returned part was not what the customer was sold. On pointing this out to the customer, he fled from the store. The owner / manager of Parramatta Prestige, Avo Soghomonian, is delighted with the result as his business, and others like his, have suffered fraudulent returns by customers for many years, costing them many thousands, possibly millions of dollars. The beauty of the DataDot system for use in recycled parts is that it is inexpensive, easy to apply and easy to detect. The most powerful aspect of the system is the deterrent effect. Once a bad guy is challenged when trying to make a false warranty claim, they will not attempt to cheat that parts supplier again and, importantly, they will most certainly tell others of their experience and the trap is dealing with parts sellers that are using the DataDot system. For more information on the DataDot system, how it works and how much it will cost, contact Geoff George at DataDot Technology in Sydney on 1300 300 829. Find out more about PartMate.